This batch was as randomly compiled as usual; the episodes didn't particularly have anything to do with each other. Ep10 dealt with the second-years going on their school trip to Kyoto, leaving the (lowly) first-years with no screentime. Ep11 actually felt like it should have been the final episode; it dealt with a changed Kyouko almost disbanding the Amusement Club. Compared to ep12, which was an all-character sleepover in the Tea Club room, it was just a better fit. 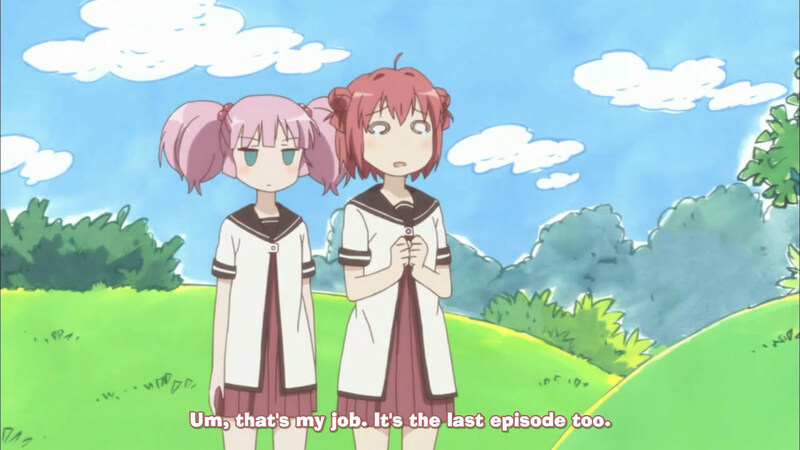 Ep10 began with the first-years lamenting that they had no screentime, and then an immediate jump to Kyouko and Yui on the bus ride to Kyoto. Kyouko, in typical fashion, was extremely excited and had all sorts of zany ideas (including going mountain-climbing in Kyoto, which was ill-advised seeing as how the city isn't mountainous). She ended up getting carsick, though it seemed all cleared up as soon as the bus arrived at its destination. Why are they all blushing? Kyoto, being the historical capital of Japan, is obviously filled with lots of landmarks, like temples. Surprisingly, the girls all seemed rather interested to see all of them. 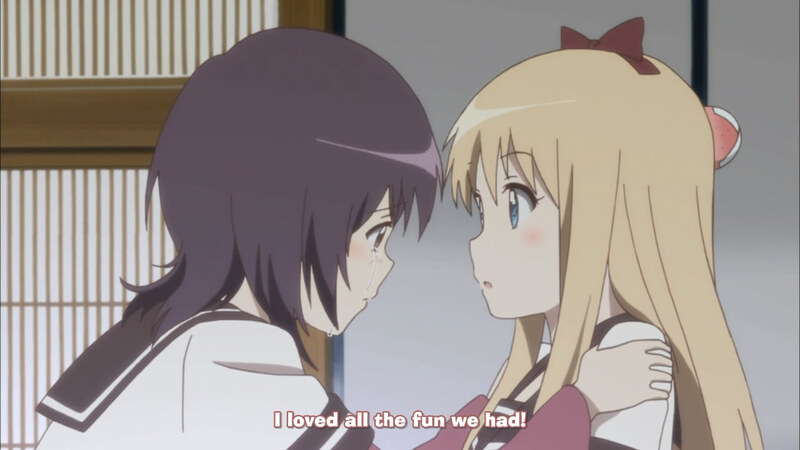 Kyouko, Yui, Ayano and Chitose stayed together for the entire day, whereas Chizuru was only seen here and there (solidifying her presence as a side character...). 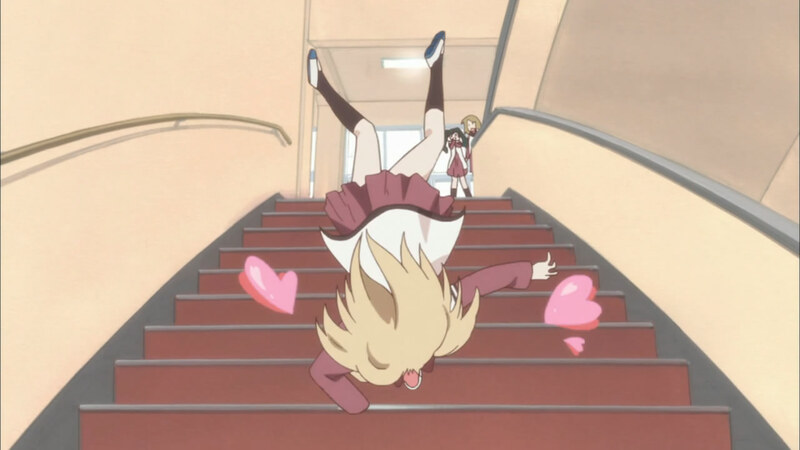 Various scenes showed Kyouko being vibrant and energetic, with Ayano chastizing her (and barely hiding her own excitement). Public baths seem pretty gross. 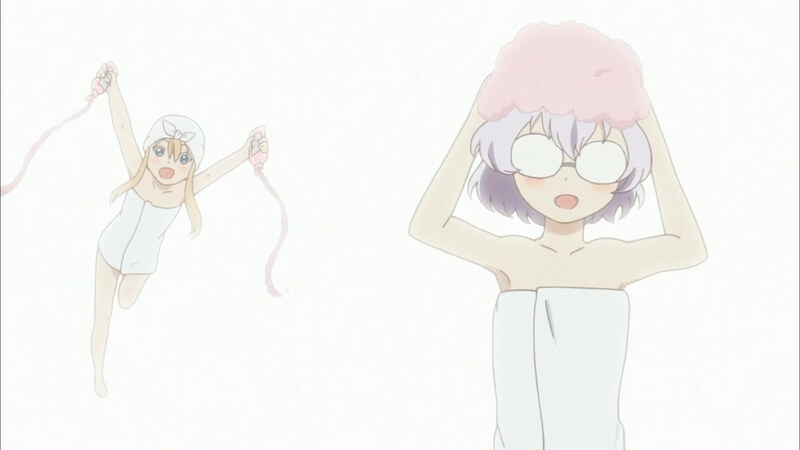 The hotel accommodations placed the four characters into the same room, and Kyouko was extremely excited to go to take a bath. (So every Japanese-style hotel has a large bath, hm...) Though Yui feared for Chitose's safety, her nosebleeds were kept to a minimum. Kyouko suffered ill effects when she walked into the sauna, coming out all fainty-fainty. That went away pretty fast, as she was ready to go to the gift store with the other girls later. Why don't you just get contacts?! 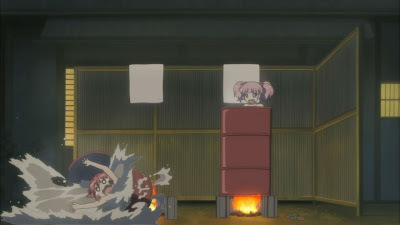 The night ended with a pillow fight, though Kyouko and Ayano decided to amp it up by only allowing a throw of the pillow if it was accompanied with feminine-speak (since Japanese differentiates between masculine and feminine ways of speaking quite a lot). Overall, it wasn't that amusing of an episode. It's not like something was done wrong; it felt more like there was something missing. I didn't laugh that often, which was pretty annoying. Ah, cooties. The worst disease known to children. Ep11 began with a flashback to the group when they were elementary children, due to the photo albums that had been brought to the clubroom. 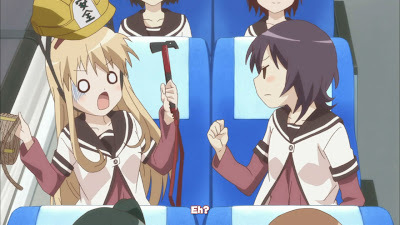 The personality differences were astounding; Kyouko was shy and demure, whereas Yui was the "captain" of the group. Akari, as well, was extremely outgoing, with longer hair (causing the buns to look less weird). 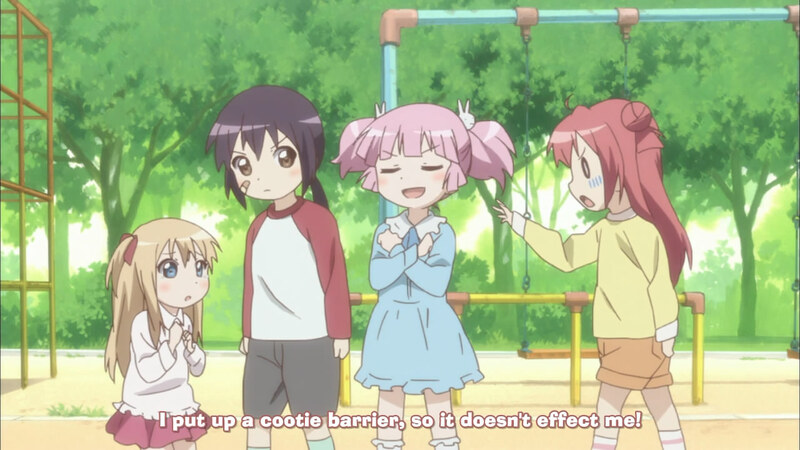 As expected, the group had accidentally met Chinatsu when younger, as she had come to visit her grandmother one day and attempted to take over the playground. It was cute to see the different personalities of the well-known characters. Hearts as symbolism for pain? 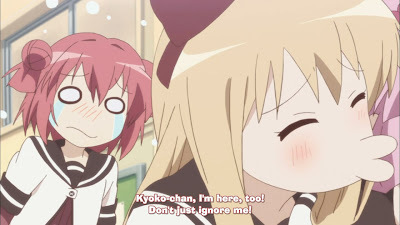 The problem began as Kyouko came back after leaving the clubroom for a while. She was a completely different person - namely, she was as rule-following and shy as in her younger years. When the girls finally had enough (after she began studying Fermat's Last Theorem), they realized that the cause was a tumble down the stairs she had taken earlier, causing a personality change. After asking the Student Council for help, Chitose deduced that another head trauma would fix the first one, and even offered some tools. Yui, being constantly worried for Kyouko, decided to try a "wait-and-see" approach instead. Maybe her long hair was actually the trick. Although many things about the new Kyouko was good - she bothered Chinatsu and Chizuru a lot less, and didn't drag everyone around for random schemes - eventually the group had had enough. Ayano was overworking herself in order to make up for her absence, while Akari felt even more unnoticeable since Kyouko wasn't ignoring her anymore (as twisted as that sounds). All of this culminated in Kyouko, being the club leader, making the decision to disband the club. The sad scene before the pain begins. 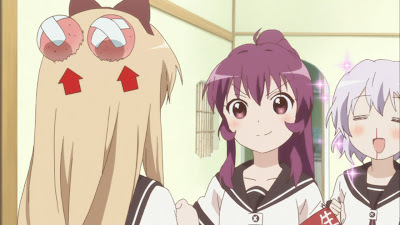 The idea was that Kyouko, wanting to follow rules, was appalled that the club was using the Tea Club room without permission, and went to Ayano to apologize, finishing with the declaration that she would soon disband the club. Meanwhile, the girls all individually had their revelations that they didn't want the new Kyouko. The final straw was when Kyouko explained away the disbanding by stating that the club did nothing anyway. 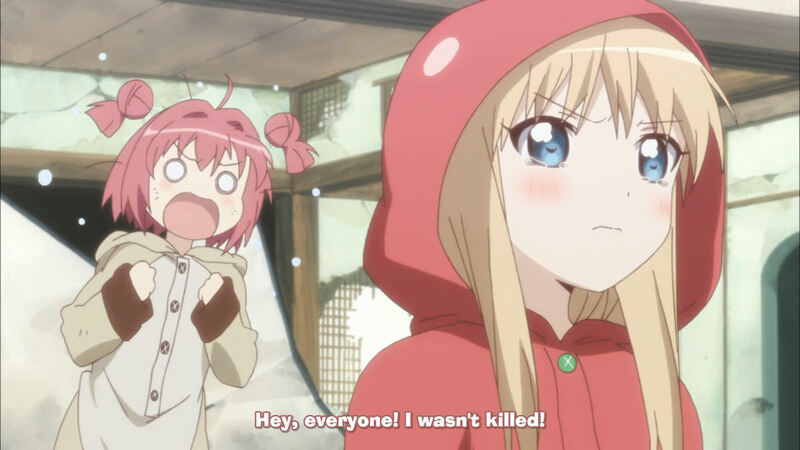 Yui kicked into gear, unable to let Kyouko do something so drastic. It's only fitting, considering that she was the one to always take care of Kyouko in their childhood. It's obvious that she's still watching out for her best friend. Or, you know, she could have just died from blunt trauma. 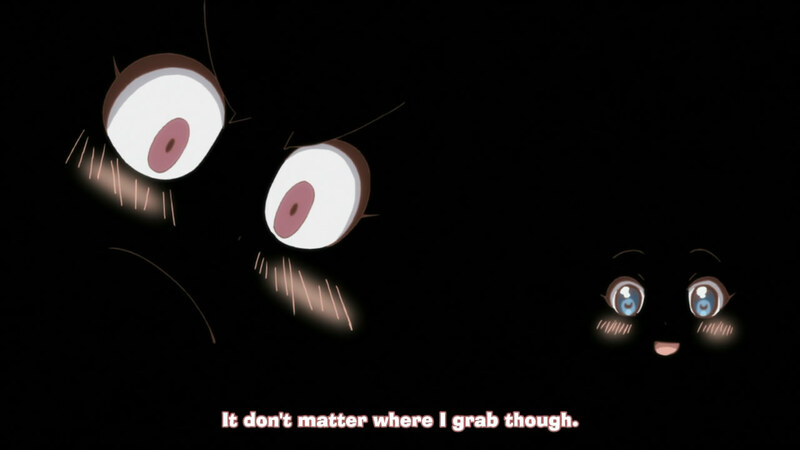 This episode seriously felt like it was a better fit for the finale instead of ep12. The threat of an end to joyful days (the disbandment, in this case) is often how anime end, anyway. 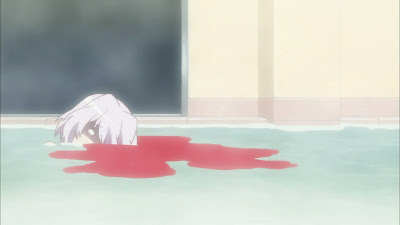 However, this was only the penultimate episode, ending with Yui having bashed Kyouko's head once more, causing another bump that reverted her to her usual personality. 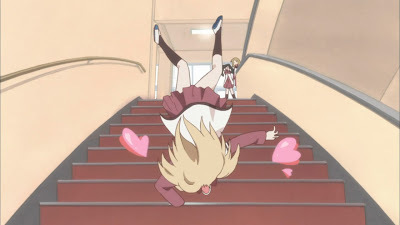 Everyone seemed happy with this outcome, except for the "new and improved" Akari, who had tumbled down some stairs while off-screen. How great would it have been for the series to end with the characters all surrounding the "main" character, ready to pummel her back to normal? Sigh. Job security is always hard to get. Ep12 began with Mari (Yui's cousin) doing the intro instead of Akari, something the "main" character was actually very broken up about. Beyond that, Ayano and Chitose approached the club, questioning why they hadn't left yet, and came to the revelation that they were planning a sleepover (with the Rise and Nishigaki-sensei helping out already). The sleepover quickly turned quite epic, with all the members of the Student Council also attending (along with Chizuru, most likely so she wouldn't be alone at home). Maybe I get the homework - but not the food request. I don't know what the random magic girl clip at the beginning was, really; Mirukurun died (on the moon) with Rivarun quite beat-up about it. I can't even begin to think about how many magic girl anime they were making fun of. 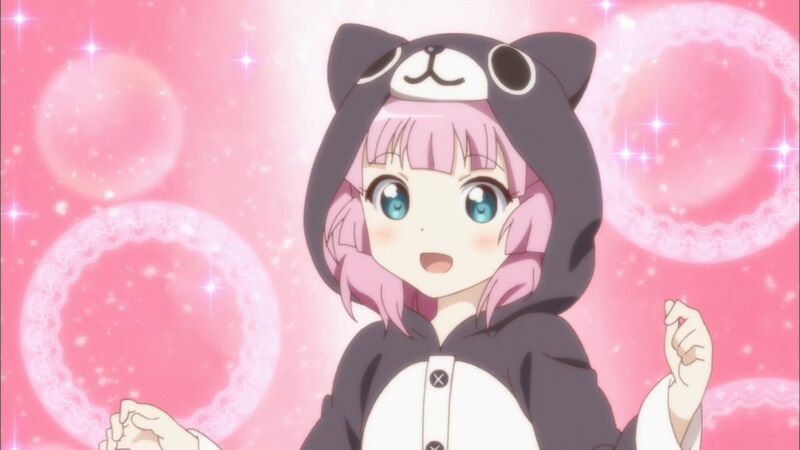 Anyway, Kyouko had special pyjamas for all the members of the Amusement Club - a cat for Chinatsu, a dog for Akari, a panda for Yui and a tomato (?) for herself. When all is said and done, the pyjamas seem quite cute but I imagine they're hard to sleep in. For one thing, as Kyouko encountered, how do you go to the bathroom easily? That's actually a very special skill. The set-up reminds me of Arakawa Under the Bridge. The project that Rise and Nishigaki-sensei had been working on earlier turned out to be a bathing facility, which the girls took turns in pairs to use. Akari, naturally, ended up getting in an accident involving her barrel rolling through the woods and falling into the river (with her still inside), causing Kyouko and Ayano to have to bathe in the same barrel. 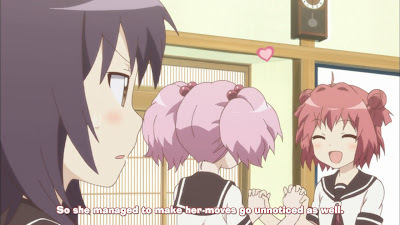 I'm surprised Akari lived through her ordeal... Dinner went well enough (though Chitose had taken multiple breaks during preparation to tend to her nosebleeds since she could apparently sense things happening outside); afterwards, Himawari and Sakurako headed out to get the futons and Chinatsu ran off to get Akari. The Kissing Monster! Destructor of Sleepovers. 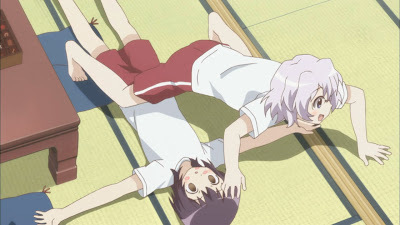 The scene was set for the second-years to be the victims of serious mauling, care of Chitose. After having some chocolate, some kind of traumatized demon came out of her, going around and kissing everyone. It caused pretty much the same kind of reaction as Chinatsu's previous jumping of Akari had; the scene was somewhat funny, but the connotations were hard for me to get passed. 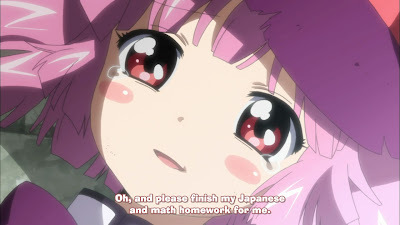 I hated the previous Chinatsu-Akari scene, after all. 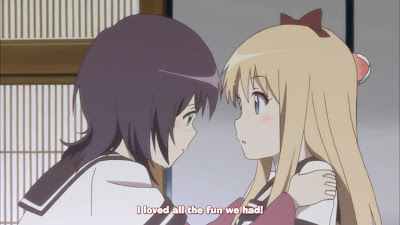 The only way to snap Chitose out of it was to "overload" her, which was achieved by Ayano kissing Kyouko. The resulting splatter was quite the sight. Main character gets the last line. With that, one of the more enjoyable anime of this season has come to an end. (Well, to be fair, it was actually a scene where Nishigaki-sensei had set up a bomb as an alarm, set to go off at 7:30, and Akari was the only one almost "killed".) I dislike how ep12 ended, and I still feel like ep11 would be a better fit as the finale. Oh well; I didn't actually expect perfection or anything.